“Mathematicians are only dealing with the structure of reasoning and they do not really care about what they are talking”. From Dr Phillip Skiba interview. Dr. Philipp Skiba is alumni of the School of Sport and Health Sciences at the University of Exeter, the same as I am, so I have a particular interest in his idea. He claims to invent unique formula which can comprehensively describe endurance. This formula now even has a special name – Sciba formula. So, what is it and where this formula came from? To answer that, let’s talk first about what endurance is and what limits it. Endurance is an ability to perform an exercise for the specific time with the particular intensity. The most popular way to describe it is, so-called, hydraulic model. 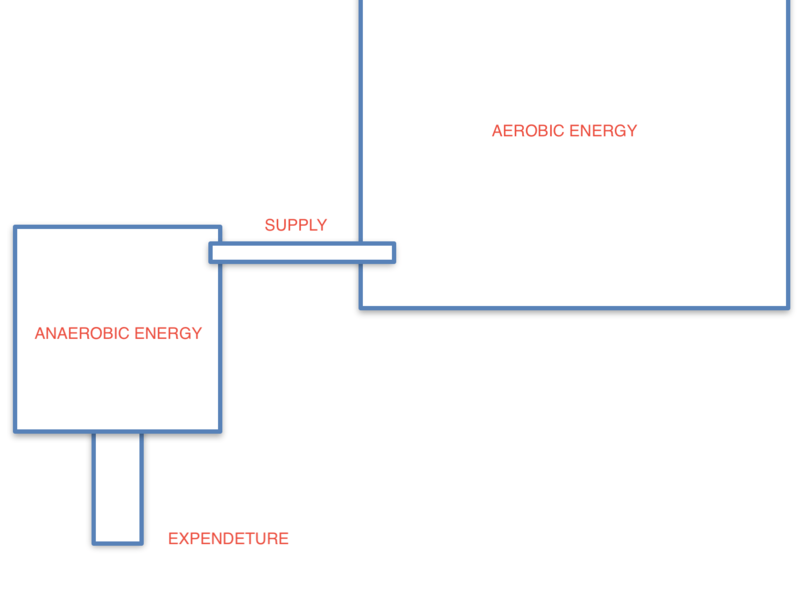 This model divides athletes energy between two sources (two tanks) aerobic and anaerobic. Aerobic energy is produced through oxidation of fat, glycogen/glucose and proteins, and this source is theoretically infinite. However rate of its production is limited. Anaerobic energy comes from ATP stores, creatine phosphate (CP) and non-oxidative glycolysis. This tank has limited capacity but theoretically unlimited rate. Both tanks are connected thus the energy from the aerobic tank can flow to anaerobic one and maintain energy level in it. However, when intensity increases above some “critical” point, expenditure of anaerobic energy exceeds its supply, anaerobic tank empties, and exercise stops. Of course, this model is an oversimplification of human performance, and there are a few more complicated hydraulic models. The interested reader may find additional information in the paper (Morton, 2006). However, the interesting question is: What does hydraulic model mean by “anaerobic tank is empty”? Well, ATP stores in muscles are very limited (few seconds of maximal work) as well as creatine phosphate stores (tens of seconds). However non-oxidative glycolysis uses the same energy compound as the aerobic process – glycogen and humans have a significant amount of it in muscles and liver. So it is very rare that person entirely runs out of glycogen at the point of exhaustion. Do you think that athlete who is exhausted after 1500 m run is empty of glycogen? No. So, what then? Well, possibly the by-products of energy metabolism are the main problem. They are produced during exercise, and our body tries to clean them out attempting to maintain homeostasis. 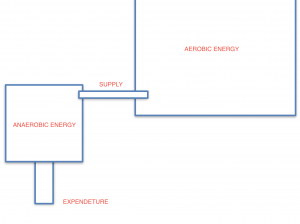 Aerobic energy production is more efficient and creates fewer by-products. Additionally, oxygen helps to clean waste and to restore ATP and creatine phosphate. However, again, when some equilibrium point is passed, waste products start to accumulate and disturb homeostasis. So, in this scenario, not the emptiness of anaerobic tank but rather its filling with waste causes the problem. My understanding of endurance is depicted metaphorically in the pictures 2, and I am using water as well. An athlete is a ship which sails in the open ocean. The ship moves using energy produced from sails – energy substrates. 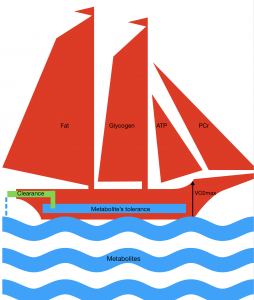 Water from the ocean (by-products/metabolites) goes over the board when the ship is moving. The ship has some reserve of buoyancy and can tolerate a limited amount of outside water (metabolites). If needed, she can pump excess water out (clearance). How much water goes over the board depends on ship’s characteristics: height (VO2max) and shape (running economy). When the intensity of exercise increases (lower picture), waves become bigger, and more water comes into the ship. Clearance system must increase its power to cope with the challenge. When it is overwhelmed, the ship takes up too much outside water and sinks. Exercise stops. Picture 2. Ship’s model of endurance. Of course, this description, like all models of human performance, is neither comprehensive nor entirely correct. In reality, metabolites come not from the external sea but instead are produced within the ship. Energy reserves are limited as well. In this sense maybe steamship would be a better metaphor. Other important limitations of my model I will discuss later. 1. 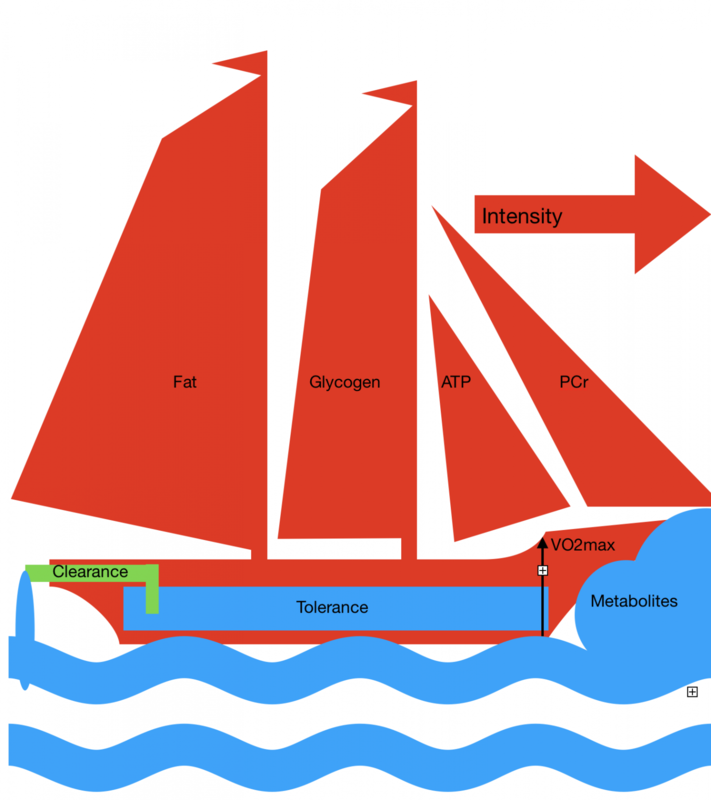 It depends on athlete ability to tolerate disturbance in homeostasis (buoyancy reserve). 2. It depends on the capacity of the metabolite’s clearance system (pump water out). 3. It depends on aerobic capacity ( boards do not allow water to come in). 4. It depends on running economy ( ship’s ability to move and to manoeuvre efficiently, without creating a significant resistance and without taking up much outside water over the boards). Without doubts, athletic population always wanted to have exact information about their ship’s parameters. At the moment we are relatively good at understanding VO2 max and can quantify our aerobic capacity. We used to define equilibrium points between metabolites production and clearance by measuring lactate and gas exchange thresholds. However, we understand that these methods are far from being comprehensive. Blood lactate is not a reason for fatigue and sometimes is a poor indicator of exhaustion. Different factors may bias gas exchange indices. We can find running economy for different intensities and activities. However, it is clear that running economy is not constant and has multifactorial influences and interactions which are difficult to follow. We don’t understand comprehensively our capacity to tolerate and clean by-products. In summary: We do not have a clear and quantifiable picture about physiology and psychology of human performance. Nevertheless, there are some attempts to build a mathematical model which can describe endurance. One of them is a basis for Skiba formula — CP- W’ concept. 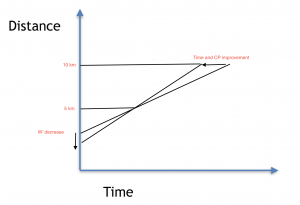 In this model, Critical Power (CP) represents the highest constant work rate that can be sustained without a progressive loss of homeostasis (D. A. Noordhof, Skiba, & de Koning, 2013). In other words, how fast our ship can run still maintaining equilibrium between taking water up and pumping it out. CP depends on board’s height (aerobic capacities), running economy and power of the pump (clearance). W’ is work that can be done above CP. In CP-W’ theory, W’ is limited and fixed. Its amount is always the same but can be spent at different rates. Thus it is basically buoyancy reserve. 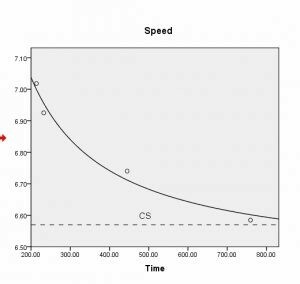 In running, CP and W’ can be substituted by Critical Speed and D’ — distance run at velocities above Critical Speed. For convenience, I continue to use CP and W’ terms in this post, even when I am talking about runners. In reality athletes, rarely perform at a constant intensity, and most activities are intermittent. Even in running athletes change their pace quite often. Thus intensity continuously goes above and below CP. 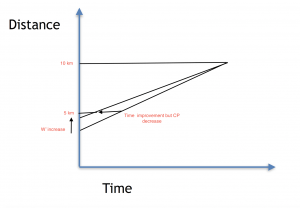 According to CP-W’ model, when it goes above CP, W’ is spent. When intensity falls below CP, W’ starts to recover. Thus, during relative rest, our ship can pump out certain metabolites that were taken during supra-CP speeds and restore, in part or in full, its buoyancy. It would be good to quantify this process thus always have information how much buoyancy has left and never to allow our ship to sink before she reaches a port. That is when Skiba formula comes to help. It claims to crack a complicated process of W’ expenditure and recovery mathematically. The basic idea is that athlete spends W’ only when he/she exercises above CP, and he spends it linear – at the same rate at given intensity. However, restoration is more complicated. It is exponential — faster at the beginning of the rest period and slower to the end. The speed of exponential recovery (time-constant) depends on rest intensity. Passive rest — athlete recovers faster; active rest — slower. Perhaps coaches and athletes already knew this long ago, however now they may get exact numbers. Initial formulas were developed in 2012 after testing seven recreational athletes (Skiba, Chidnok, Vanhatalo, & Jones, 2012). Where W is subject’s W’; Wbal is W’ remaining at a particular moment; Wex is W’ already spent ; (t-u) is a rest period and Tw’ is time-constant for W’ recovery. Where Dcp is rest intensity as a distance from CP. Don’t be afraid of this frightening formula because in simple words it means that at every particular moment athlete’s remaining endurance reserve is equal to the difference between the overall W’ and the total sum of the W’ expended and exponentially recovered in different work-rest intervals before this time. In following years this formula was developed into new equation (Skiba, Fulford, Clarke, Vanhatalo, & Jones, 2015). W′(t) is an end up W’ after a single bout of work and following rest period, W'(0) is initial W’ at the start of the bout, W’exp is W’ expended during the bout, Dcp is rest intensity as a distance from CP. Possibly a little bit complicated but the idea is generally the same as in original formula. The best way to use these findings is clear: test an athlete and find out his/her specific recovery equation. Then use it in training and maybe even in competitions. Perhaps Skiba meant precisely that in his interview. It even may be possible to include this equation in running watches software and bike’s power meters thus athletes can always have information how much W’ they still have. W’ is nothing more than mathematical manipulation. 2. Be, indeed, limited and fixed. Of course W’, as it refers to “capacity to perform work above CP”, is limited. It is clear that no-one can perform intense exercise indefinitely. 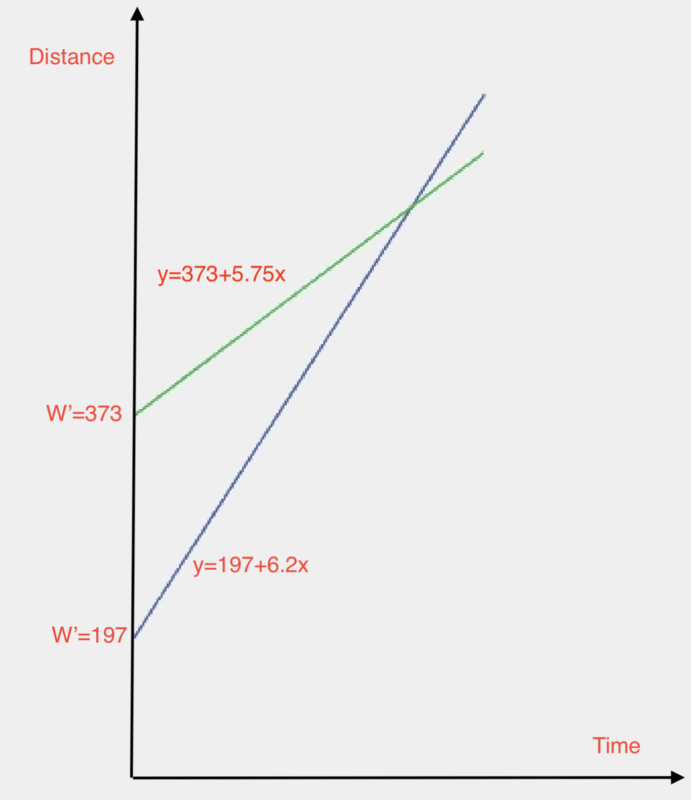 Let’s have a look at how reliable is W’ estimation based on running. 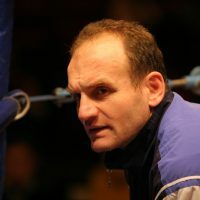 To find athlete’s CP and W’, he/she needs to make 4-5 exhaustive bouts lasting from 2 to 15 minutes. Alternatively, you can take athlete’s best results at distances between 800 and 5000 meters. 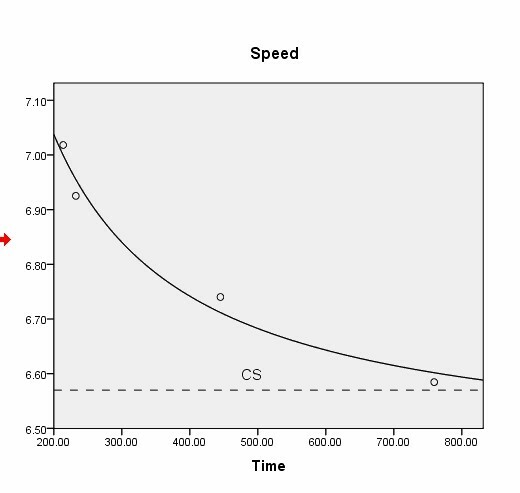 Then you can plot P (speed/power) against time this speed can be sustained (T). It is an inverse curve where constant (asymptote) represents CP and coefficient is equal W’ (picture 3). Picture 3. Hyperbolic CP-W’ model. 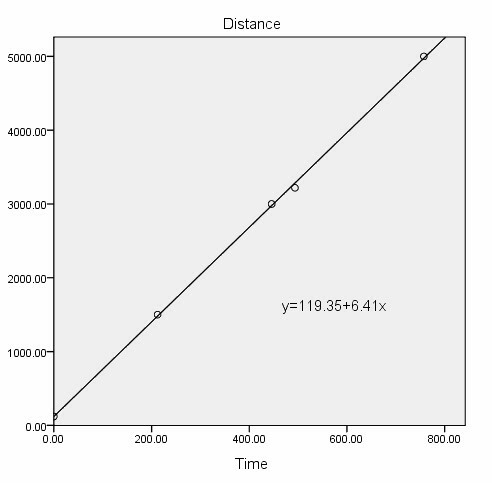 Another way is to plot linear regression – distance against time (picture 4). Best fitted line for 4-5 time trials (e.g. 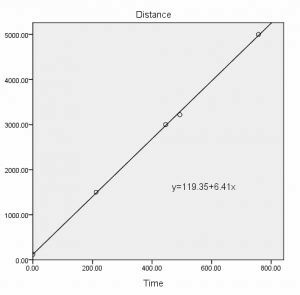 800 – 5000 meters for running) gives you W’ which is a constant (intercept with axis Distance ) and CP is a coefficient (slope of the line). Picture 4. Linear CP-W’ model. Let’s play a little with linear regression because it is possibly more intuitive and simple. You can see from the graph that CP and W’ basically reflect relationship between athlete’s speed over shorter and longer distances. Actually you can take just two distances to draw the line. If hypothetical athlete can maintain his short-distance speed over a longer distance, then the graph would be like on the picture 5 . Picture 5. 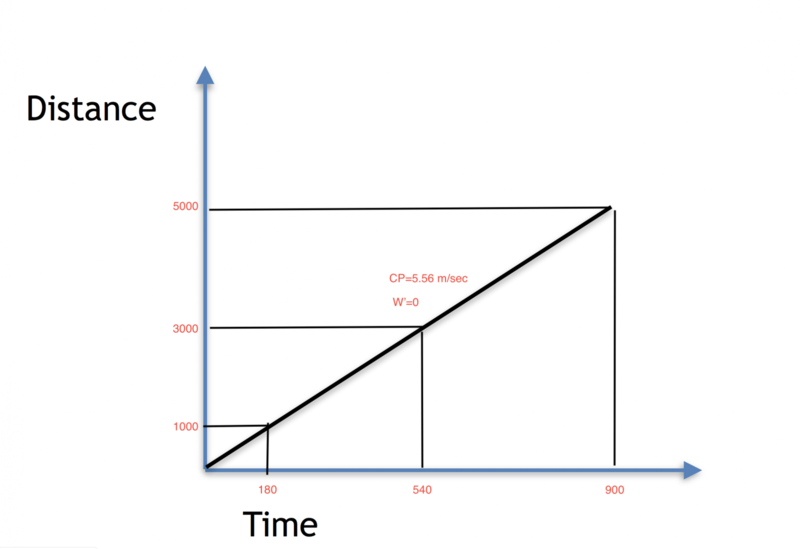 Hypothetical model where speed can be sustained indefinitely. So there is no W’ at all and CP is a constant speed over the range of distances. Like a car which can maintain 100 km/h over one kilometre or one hundred kilometres without being tired. Of course, for humans this situation is impossible, nevertheless, the closer the speed on longer distances is to the speed on shorter ones, the better is CP. Well, if athlete improves on longer distance while staying the same on shorter, it would be better for CP, but due to the line becomes steeper, it intercepts Y-axis lower thus W’ decreases (picture 6). Picture 6. Improvement on 10 km without improvement on 5 km. 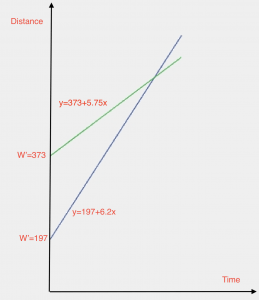 In opposite, if you improved your speed on shorter distance and remain the same on longer, then W’ increases but the slope of the line (CP) decreases (picture 7). Picture 7. Improvement on 5 km without improvement on 10 km. You can ask — why your improvement in some distances without impairment on others make some of your qualities worsen? Isn’t it illogical from practical and physiological perspective?This paradox or, more likely, simple clockwise and counterclockwise rotation is something that often happens in experiments. For example, when CP was increased in a group of athletes by hyperoxia condition, their W’ decreased though overall amount of high-intensity work was increased (Vanhatalo, Fulford, DiMenna, & Jones, 2010). While authors were desperately trying to find any plausible physiological explanation, in my opinion, it is a just fundamental flaw in the method itself. The bouts should be not less than 2 min, otherwise, factors different from CP and W’, such as absolute speed, can play a significant role. We are interested mostly in endurance, thus possibly too short distances are not suitable in this case. They should not be longer than 15 min, because the causes of fatigue may be significantly different in long runs. In long-running VO2, and other homeostasis indicators, can temporally stabilise and fatigue may be significantly influenced by the depletion of glycogen in certain muscle’s fibres and sites, muscles damage, rising core temperature and the inhibitory effect of the central nervous system. Obviously, if you include longer distances and “slow” surfaces (roads and indoors) into the analysis that decreases CP and increases W’. It is exactly what happened when Andrew Jones, one of the most respected apologists of CP-W’ theory, calculated CP and W’ for elite marathoners (Jones & Vanhatalo, 2017). He took distances up to 15 km, and his results were quite different from obtained with classical method. For example, Mo Farrah CP and W’ were 5.75 and 373 respectively, according to Jones, whereas my classical estimation resulted in 6.2 and 197 (Picture 8). This difference is huge so which one of W’s we should input into Skiba formula? It looks like W’ estimation is fundamentally unreliable and prone to mathematical manipulations. Picture 8. Jones et al. (green line) and my ( blue line) CP and W’ estimation. I mean is it always the same for every condition? Let’s use Jones data and check how fixed is W’. W= CP x T + W’. W for runners is equal to the distance, T — time over that distance. If CP-W’ theory is correct, then W’s which we calculate for different distances should be almost the same and close to Jones estimation. Let’s take Mo Farah results. I give you an example of how I have found his W’ for 800m. Mo Farah personal best on this distance is 108.69 sec. It is more than two times less than Jones number. Table 1. Mo Farah W’ (meters) calculated for his different personal-best using Jones CP (5.75 m/sec). So we can see large variability of W’ on different distances. It looks unlikely that it is fixed. I understand that counterargument here may be that personal bests were made in different years of sporting career and in different conditions. Nevertheless, variations are so significant that I think the picture is clear – W’ cannot be used for predicting athlete performance. My conclusion is in agreement with numerous studies which investigates the usefulness of W’ (Papoti et al., 2005; Vandewalle, Vautier, Kachouri, Lechevalier, & Monod, 1997). It makes rationale behind Skiba formula wrong, and regardless how fine its math is, the output is useless. Why it is unlikely that W’ is fixed? During intense exercises, multiple metabolites are produced, and different factors have unequal contributions to W’ depletion throughout intensity’s spectrum. Under one condition, some factors play a predominant role, and at the other – others. It is probably where my metaphor about buoyancy reserve is not entirely correct. “Outside water” is not always the same. In different intensities, it consists of different metabolites and different proportions of them. So it is not only a volume of our buoyancy tank is important but the heaviness of the waste products that fill it. Moreover, even the shape of our ship (running economy) and heights of its boards (aerobic capacity) are not always the same. They may change in dependence on different factors, and this may alter W’. Experienced athletes intuitively know their reserve, and they feel how much W’ they have left. Skiba builds overcomplicated math on incorrect and oversimplified assumptions about human endurance. I cannot see how his formula may have an advantage compare to athlete’s and coach’s experience and intuition. Honestly, in my opinion there, is nothing scientific in this equation. Just mathematical exercise. 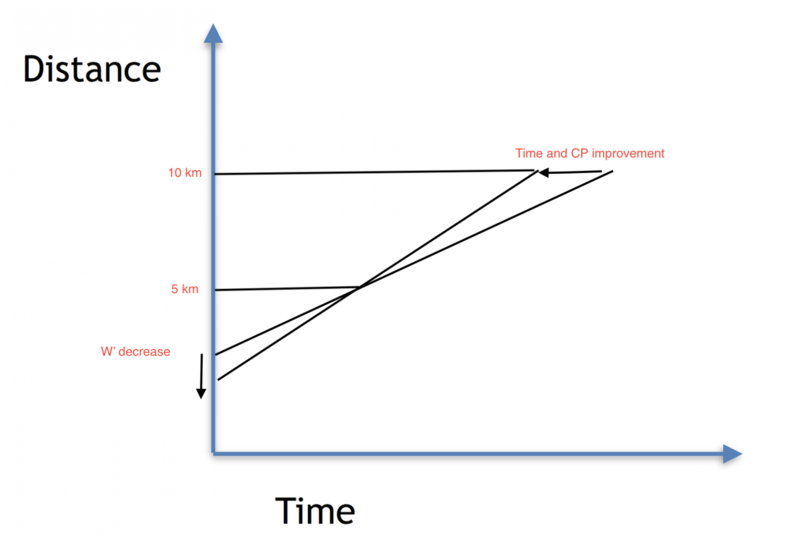 CP reflects the relationship between velocities over longer and shorter distances. Nothing more nothing less. This number itself has no physiological meaning and depends on the choice of distances you take. In that sense, it can be useful for monitoring dynamic of the training process. 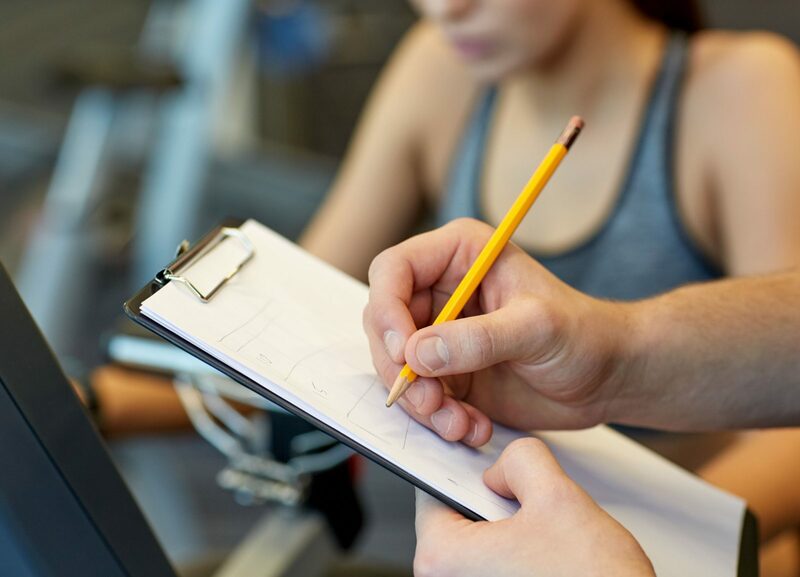 Athletic coaches use speeds over different distances for exercise’s prescription and monitoring for a long time. 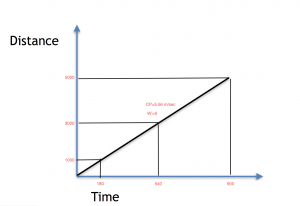 You can use mathematically derived CP instead of these empirical speeds if you want. For example, I do that for the approximation of the speed for interval training. However, I do not claim that it has some scientific advantage. No, it is just one of the methods. W’, in my opinion, is useless. It is surprising to me why so many sports scientists continue to search the way to improve Skiba formula without questioning its primary input. 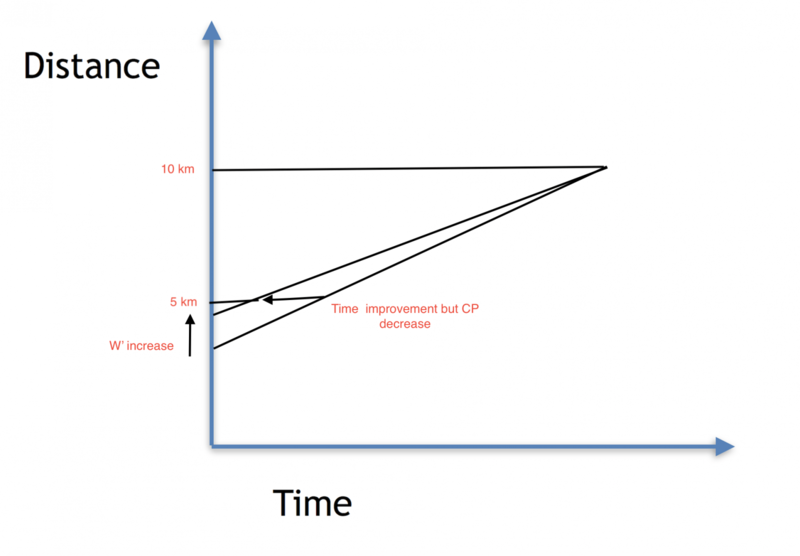 A fundamental flaw in CP-W’ theory is an over-simplistic and mechanistic approach to the human performance. Humans and airplanes are not the same. We created airplane thus we (or at least some of us) understand how it works. However, we did not create ourselves and, at the moment, we are still far from understanding us. Jones, A. M., & Vanhatalo, A. (2017). The ‘Critical Power’ Concept: Applications to Sports Performance with a Focus on Intermittent High-Intensity Exercise. Sports Med, 47(Suppl 1), 65-78. Morton, R. H. (2006). The critical power and related whole-body bioenergetic models. European Journal of Applied Physiology, 96(4), 339-354. Noordhof, D. A., Skiba, P. F., & de Koning, J. J. (2013). Determining anaerobic capacity in sporting activities. International Journal of Sports Physiology and Performance, 8(5), 475-482. Papoti, M., Zagatto, A. M., Freitas Júnior, P. B. d., Cunha, S. A., Martins, L. E. B., & Gobatto, C. A. (2005). Utilização do intercepto-y na avaliação da aptidão anaeróbia e predição da performance de nadadores treinados. Revista Brasileira de Medicina do Esporte, 11, 126-130. Skiba, P. F., Chidnok, W., Vanhatalo, A., & Jones, A. M. (2012). Modeling the expenditure and reconstitution of work capacity above critical power. Medicine and science in sports and exercise, 44(8), 1526-1532.Skiba, P. F., Fulford, J., Clarke, D. C., Vanhatalo, A., & Jones, A. M. (2015). Intramuscular determinants of the ability to recover work capacity above critical power. European Journal of Applied Physiology, 115(4), 703-713. Vandewalle, H., Vautier, J. F., Kachouri, M., Lechevalier, J., & Monod, H. (1997). Work-exhaustion time relationships and the critical power concept. A critical review. J Sports Med Phys Fitness, 37(2), 89-102. Vanhatalo, A., Fulford, J., DiMenna, F. J., & Jones, A. M. (2010). Influence of hyperoxia on muscle metabolic responses and the power-duration relationship during severe-intensity exercise in humans: a 31P magnetic resonance spectroscopy study. Exp Physiol, 95(4), 528-540. Previous StoryExtreme weight-cutting: No need for drama, mate. Next StorySplit running workout for beginners.